The village of Chilton lies in the valley of the Eden Code, a tributary of the river Thames. The scene is one of great variety and beauty, and the people are intelligent and godly above many. Mr. Richard Norton, local preacher, class leader, and formerly circuit steward, is about the best known man in the locality. He came here many years ago from Landford. Here he married and carried on the trade of a builder, by which he served the public by building houses, and the church by building chapels; some seven chapels stand to-day as monuments to his memory. 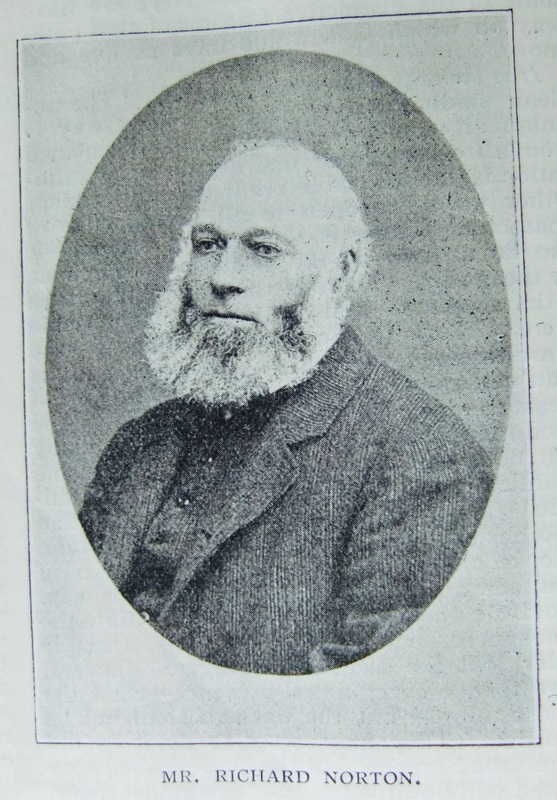 His connection with our church dates back to 1849, when he was led to hear the early preachers and get converted and join the society in his native place. After six months’ preparation by attending the class meetings and other services he was put on the plan, exercising his ministry far and near in the villages that now form the Witney and Chipping Norton circuits. He had always a great delight in Camp-meetings and open-air services generally. When he settled at Chilton the services were held in a room belonging to Mr. Robinson. Here a Sunday school was started that produced a far-reaching effect on the neighbourhood and bore fruit in the salvation of many young people that are now doing duty for God and man in Worcester, Reading, London and elsewhere. In 1867 Mr. Norton set to work to build the chapel we now occupy. It was a great undertaking, as our people were few and poor, and at first it seemed as if it would fail, but unlikely persons from without came forward to help. A church lady gave stones and cartage and subscribed £10, and a Baptist gentleman, now a J.P., set his children to collect and himself laid a foundation stone. The work prospered and after years of struggle and self-sacrifice the property was declared out of debt, and the services and the Sunday school, like a fountain of water in the village were a means of life and blessing to all around. Mr. Norton has been a subscriber to our magazines for 50 years and is a generous supporter of all our funds. Between Chilton and Witney till within a recent date lay a vast forest called Wychwood, intersected by very bad roads, rendering it almost impossible for the preachers to return at night from their appointments. Mr. Norton, supported by his excellent wife, rendered this unnecessary by providing a home. Ministers in all parts of the Old Brinkworth District have a grateful recollection of his accommodation, and of happy hours spent on Hill Side. Two sons, one of whom is in London and the other in Londonderry, and the two daughters, have carried to their different spheres the influence of many prayers and of the consecrated lives of parents and ministers. In early days our people were despised and persecuted, and our friend suffered much in common with his brethren. Leading people in the neighbourhood withheld their support, employing men from a distance rather than employ a dissenter. He has survived this, and while many of these proud and bigoted persons came to poverty and have died away, Mr. Norton has prospered, and now has his own house with a valuable property in land, and secure from want and financial embarrassment, has comparative ease and comfort. He is not now able to attend the Quarterly Meeting, District Committee, or Annual synod, but still takes a lively interest in the work of our Church; meets his class, is regular in attendance at the Sabbath and week-night services and is regarded with respect and affection by all who know him. May his sun ere it sets, give out a still clear light, and at length go down without a cloud. By the favour of the editor we also supply a portrait of the late Mrs. Eliza Lloyd, an old member of our Witney Society who died in July of last year. 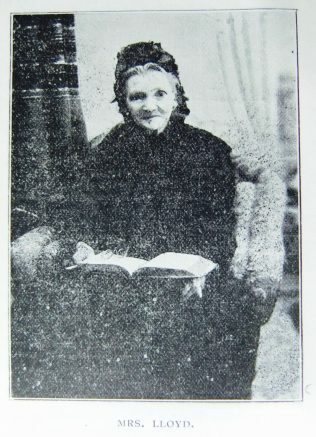 This good lady and her late husband, were for many years leading members of our church, the friends of the ministers and local preachers of early days, and the pioneers of mission work in several places. Two of Mr. Lloyd’s spiritual sons are in our ministry, and others are in the front rank of service. The name often comes up in lovefeasts and social conversation, and will be long remembered by our people. They are now represented in our Witney Society by Mrs. Viner and her sister, and the Viner family, five sons and four daughters, all of whom are members, the eldest son a local preacher, and several other workers in the Sunday school and Christian Endeavour. Richard Norton was baptised on 27 November 1831 at St Martin, Sandford, Oxfordshire. His parents were Francis, a mason, and Susannah. Richard moved to Chilson, not Chilton as printed in the Messenger sketch. Richard married Lucy Milton Jackson (abt 1828-1875) in early 1857 in the Woodstock Registration District, Oxfordshire. Census returns identify four children. Richard married Ann Lardener (1827-1901) in late 1876 in the Chipping Norton Registration District. Ann was a lady’s maid before her marriage. Richard married Emma Woolgrove, nee Hartley (1933-1914) in early 1903 at Banbury, Oxfordshire. Richard died on 20 July 1903 at Moreton-in-the-Marsh, Gloucestershire. Eliza Lloyd, nee Panting was baptised on 7 January 1819 at Shipston under Wychwood, Oxfordshire. Her parents were John and Ann panting. John was a labourer. Eliza married Alban Lloyd (1806-1874), a dyer, originally from Exeter, Devon, in late 1842 in the Oxford Registration District. It was his second marriage. Census returns identify three children. Eliza died in July 1899 at Witney, Oxfordshire. This page was modified on 5 March 2018 to add a transcription of the obituary published in the Primitive Methodist Magazine 1905.